This is my terribly awfully late take on Amy's theme "All things related to cameras" forthe Ringo Pie bee. 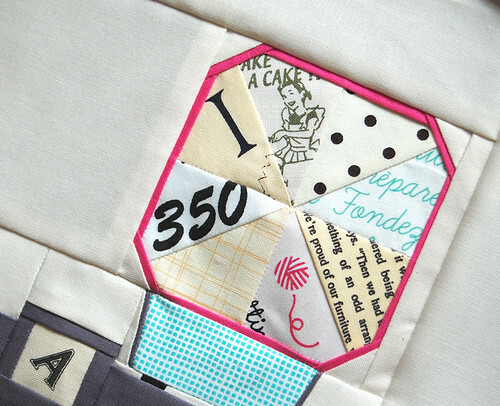 It's my very last block for the first round of the Ringo Pie bee, the first quilting bee I've ever joined! No need to be sad about though, because we kicked off the second round this month! I just really love the concept of this bee and the very friendly, encouraging and inspiring bunch of friends in the bee. Making one block takes a lot of time and energy, but I like the way this challenge stimulates my creative mind and helps me go beyond my comfort zone. For some reasons I was really intimidated to make this block. My ideas for my block for her kept changing, but I ended up with this camera block which is modeled after Diana F+ clone camera. 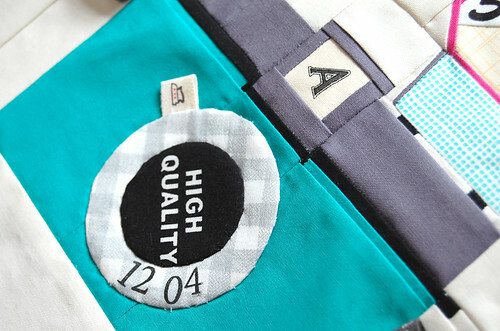 Its retro look reminded me of Amy's style a lot ;)Obviously, the tape is not sewn. I just found the ribbon in my stash and had totake a picture with it because it looks like a camera strap! This humongous flash light could have used more contrasting fabrics maybe. My instinct was calling for yellow fabrics for it, but there is a reason I had to resist. When Amy and I hung out in Tokyo, (Yes! I've met her in person! How cool is that? 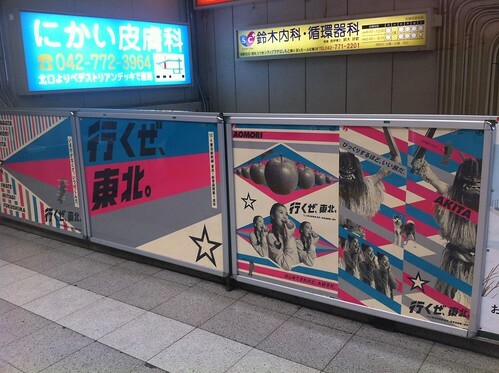 ), she told me she really liked these posters she saw at JR train stations. Photo Credit: n_wakaThese are the ads to encourage people to take a trip to the northeastern part of Japan, the area that was affected by the tragedy last year. Amy and I both thought the colors on these posters are "so Amy". If you know me well, you know it was the moment I knew my block for her will be in this colorway, hehe. The reason for 12 04? It's the date I hung out with her, December fourth last year. My fingers are crossed Amy will like it. what a great block. I am sure she will love it. Amy will adore this! I know I'd love it too, but with all my paints and messy studio there is n o way it would be safe! Beautifuly done Ayumills!! I love your block! It would be neat to include the strap somehow. maybe a little loop so it could be removable. How could AMy not like this block? It is amazing and you have done an beautiful job once again. You are sooo creative & talented!! Really love this block! The colours are just awesome! I love how you draw your inspiration for quilt blocks from things like subway signs and everyday things that many people pass over as just being "there." your blocks always go above and beyond, Ayumi! Your thoughtfulness always touches my heart! Wow Ayumi!! I would die if that showed up on my doorstep, Amy is so lucky!! It is too fabulous and I would say well worth the wait! I love it!! 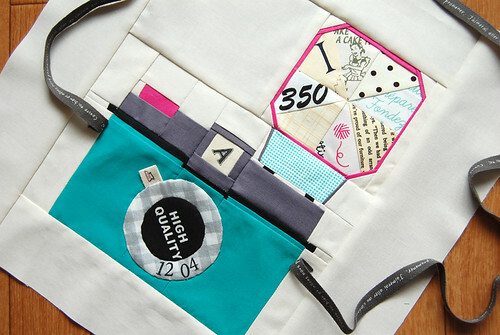 This is such a great idea and your block is fab! She WILL love it. It is too fabulous! Oh, Ayumi, it is just darling! How pretty! I really love the flash... 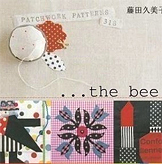 The fabrics you chose and how you placed them remind me of the old reflector-type of bulb. It's nice how you included just personal details like the date... Lovely. Oh my gosh, Ayumi. You always put so much of yourself and so much thought in your blocks. I can't think of any reason why Amy wouldn't love this block. Awesome block! Love the creativity and the personalization! What a smart and fun block! It is stunning, well done! Your blocks - and project in general - are always so lovely and personal. What a beautiful way to end round 1 of Ringo Pie! I love the way you pieced the flash too. Ayumi ~ That's amazing. I am positive Amy will be thrilled with that. Heck, if you were supposed to send that to me I wouldn't care if it was a year late because it is just that awesome looking. Great job. Oh my, if she doesn't love it you can send it my way - LOLOL. The block is FABULOUS. I love it. Of course, I love taking photos, so it really hit the spot with me. You did great. ohmygoodness, this is AMAZING! holy crap! there are so many little details that all add up to perfection. congratulations! You nailed Amy's taste! It definitely has that retro vibe that she loves so much...and yet it is so perfectly you at the same time. Great job! Really really gorgeous! I wish I had your creative ability! Love this block and think the flashlight section is just perfect. Your camera block is wonderful! I love how you used those super cute prints in the flash -- I never would have thought to do that. And the super-fine outlines in grey and pink are fantastic! it's brilliant, Ayumi! the flash totally resembles the train station posters. i love the sentiment of the 12 04! The block is great!! And as usually - you used very nice fabrics! J. It's amazing Ayumi!! The colors are perfect!! I think she is going to love it!! I love the flash and all of the little details!! The strap is the perfect touch to this absolutely mind blowing piece of work. I love it! Hi Ayumi! I love your projects, they are so amazing! But I've never seen something like this: incredible job, girl! Regards from Brazil! Of course she will LOVE it! Amazing talent you have Ayumi! totally incredible. you are amazing as always ayumi!!!! How could she NOT love it? It's amazing, Ayumi. Seriously, this is one of my favorite things you've ever made. And that's saying something! I've really enjoyed watching this bee. Some truly amazing works of art have been made. Fun AND beautiful, Ayumi! You are a total star, putting so much taught and amazing detail into your work. As always a very pleasant read !Thanks for making time to share! Hiii Ayumi, it is wonderful to visit you and see your latest creations! They are mind-blowing and amazing as always! Ciao Ayumi, nice to meet you! It's our first time that we get in touch with your very beautiful and very useful blog! Thank you for your tutorials well done and easy to understand. Now you are on our favourite blogs. 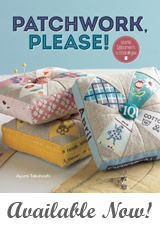 Well, she must love it, there is so much sentiment and thought put into this block, Ayumi! You did such an incredible job on every detail. The flash bulb is fantastic with the prints all radiating out and I just love the lens details, too. 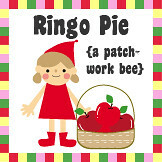 I'm happy to hear Ringo Pie will go around again because the blocks you make for this bee are so inspiring. I can't wait to see what else you create for your bee mates! Awesome work no doubt you are very creative mind and i learn a lot of things from your blog for example i have created a jewelry box with the help of your post. this block is perfect, great job! please tell me you have the pattern to share?! 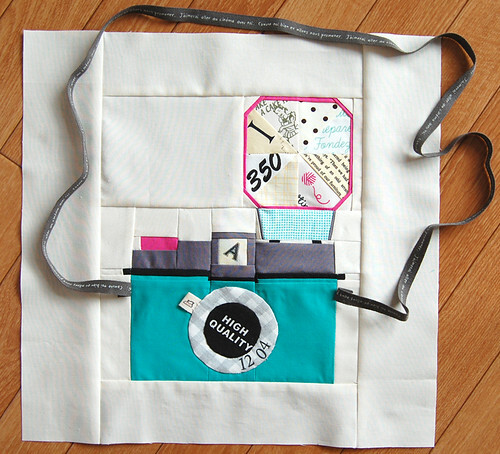 I am in a mini quilt swap and it would be perfect for my partner. it's exact;y what I've been looking for!